Mount Carmel is a 1500' limestone ridge overlooking Haifa and the Mediterranean Sea in northern Israel, sacred as the home of the prophet Elijah and the place of origin of the Carmelite Order of Catholic monks and nuns, which has maintained a presence on the mountain subject to interruption by the repeated conflicts in the region. During the Napoleonic invasion of 1799, the Stella Maris monastery of Carmelite Friars there was badly damaged, and in 1816 Italian brother Giovanni Battista Casini went to oversee its restoration. 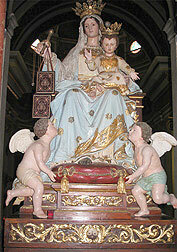 During a return to Genoa in 1820, he commissioned a statue of Our Lady of Mount Carmel from sculptor Giovanni Battista Garaventa. The cedarwood image was solemnly crowned at the Vatican in 1823 and remained in Rome until 1835, when it finally reached Mount Carmel. On June 10, 1836, the restored church was blessed, Our Lady's statue enthroned, and regular monastic life resumed at Stella Maris. Garaventa's work was made to be vested in fabric; only the head and hands were finely carved. In 1933, Roman sculptor Emanuele Rieda refashioned the body with carved robes. On the second or occasionally the third Sunday after Easter, the statue of Our Lady of Mount Carmel traverses Haifa from the Roman Catholic parish to the Stella Maris monastery in a solemn procession with the patriarch, bishops, friars and sisters, musicians, scouts, seminarians, and a crowd of people from many faiths.